Teach your kids to be tooth care experts without reminders or nagging! 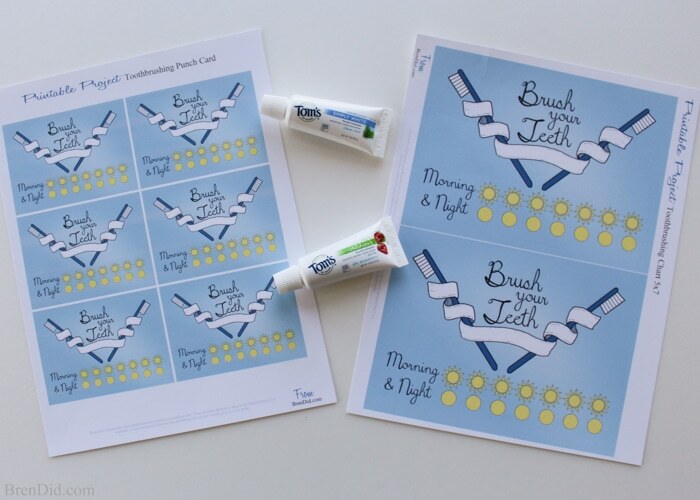 This free printable Tooth Brushing Chart and Tooth Brushing Punch Card encourages kids to brush each day. A special thanks to Tom's of Maine for sponsoring this post. This post uses affiliate links. They don’t cost you a thing and help us bring you creative projects. Read more in Policies & Disclosures. Let’s face it, kids are not always the best at tooth care and tooth brushing. Luckily most kids love tasty toothpaste flavors and getting to check items off a to-do list. 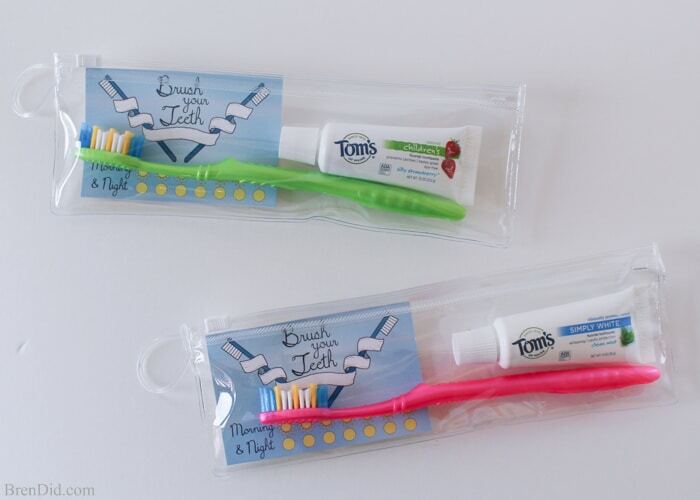 Put the two together to help your kids build a healthy tooth care routine. 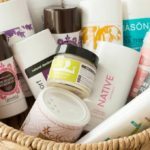 If you’ve been reading Bren Did for long you know that I am very cautious about the personal care products our family uses. 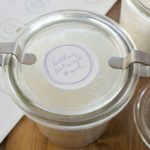 I make many of my own items and thoroughly research any purchases on the EWG database or the Think Dirty app before buying. Tom's of Maine is a toothpaste brand that our family has used for years. It rates well on the EWG scale and does not contain triclosan. According to the FDA, triclosan is a anti-bacterial agent that is found in many toothpaste brands. 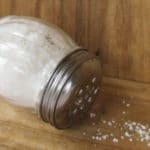 It can cause endocrine disruption and may alter hormone regulation. Yuck! I do not want this substance entering the mouths of my loved ones! 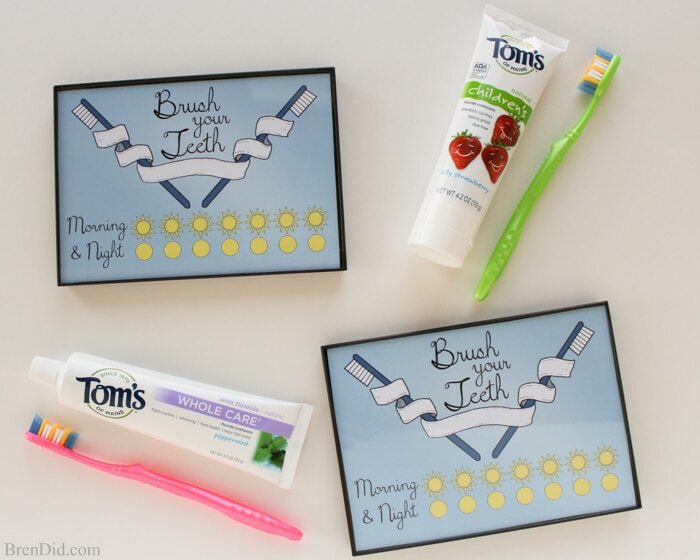 Luckily, Tom's of Maine comes in a variety of flavors (from mint to strawberry) that make it easy to get your family to use natural toothpaste! I am thrilled that there is a fruity version, we have a mint hater at the Bren Did homestead. All the natural toothpastes we tried were labeled “too spicy” until we came upon Silly Strawberry! You can also feel good knowing that Tom's of Maine toothpaste is made in the United States (Maine to be precise)! 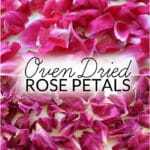 They do not use animal ingredients or animal testing. 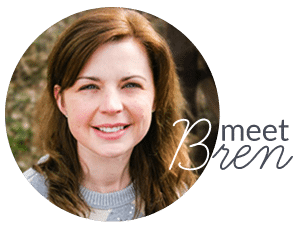 Once I solved the toothpaste problem I wanted an easy way to help my kids remember to brush their teeth… without continually being pestered and nagged. I developed a cute printable tooth brushing chart that I'm happy to share with your family. 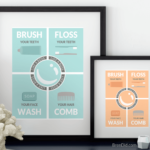 Simply download the chart in the free printable library and place it in a 5×7 frame to create a dry erase tooth brushing reminder. I have one for each of my kiddos near their toothbrushes. It reminds them to brush both morning and night. Wipe it clean each week for a “new” chart. 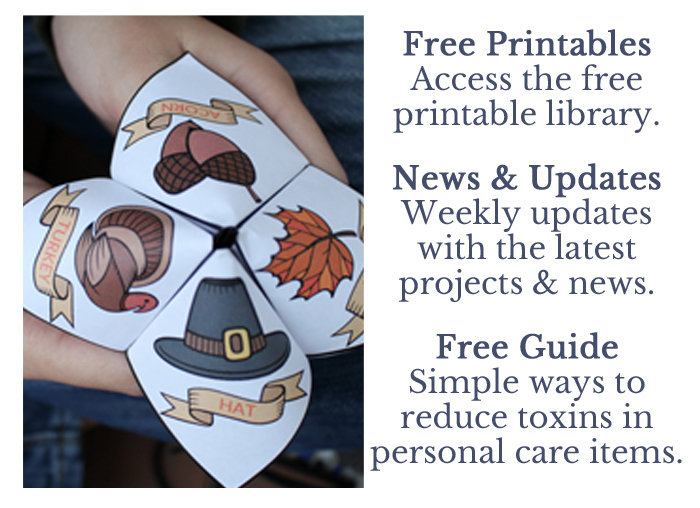 My printables don't end with a simple chart! 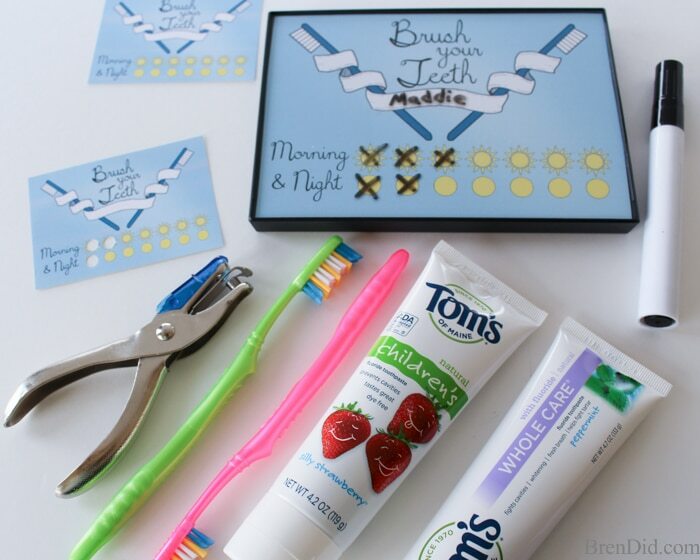 I also created a punch card that helps with tooth brushing while traveling, on vacation, or even at school. Kids can simply check off the sun and moon each day or use a hole punch for extra fun. Aren't they adorable in a travel case? For best results print the chart and punch card on matte photo paper or cardstock. Trim to size and enjoy! Download the Free Tooth Brushing Chart PDF. 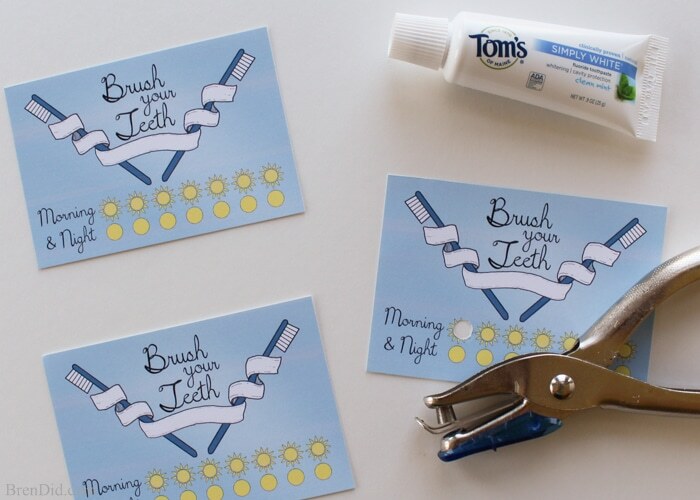 Download the Free Tooth Brushing Punch Card PDF in the free printable library. Great idea to make teeth brushing more fun!